The Winnipeg Jets wrap up their 2018-19 regular season schedule tonight when they play the Arizona Coyotes at Gila River Arena…The Jets are 1-1-1 on their four-game season-ending road trip after losing 3-2 in overtime to the Colorado Avalanche on Thursday night…The Jets begin the first round of the Stanley Cup Playoffs next week against an opponent that is to be determined. The Jets have clinched their spot in the 2019 Stanley Cup Playoffs…It’s the first time in franchise history that the Jets have reached the playoffs in back-to-back seasons…The Jets need to win tonight to clinch home ice in the first round of the playoffs…A win combined with a Nashville Predators loss in any fashion would give the Jets their first division title since relocation…If the playoffs started today, the Jets would host the St. Louis Blues, who are third in the Central Division, in the first round of the playoffs. Tonight is the third of three time zones the Jets play in during their final road trip of the season…After staying in the central time zone on Monday against Chicago and Tuesday against Minnesota, the Jets played in the mountain daylight time zone on Thursday against Colorado and play in mountain standard time zone tomorrow Arizona…After staying in the central time zone for their first 10 games, the Jets will have played 26 games this season that were in a different zone time than the previous game by the time the regular season is over. Winnipeg is 21-18-1 on the road this season, which has set a franchise record for most road wins in a season…Winnipeg hasn’t lost three consecutive road games in regulation since Dec. 10-20/16…Winnipeg is 21-for-23 (91.3%) on the penalty kill in its past eight road games…Blake Wheeler leads the Jets in scoring on the road this season with 39 points (10G, 29A) in 40 games…Patrik Laine leads the Jets with 19 goals on the road. The Jets are 15-6-2 against Pacific Division opponents this season, which is the most wins against the division by a team outside the division…Winnipeg has won 10 of their past 15 games against the Pacific Division…Winnipeg was a dominant 17-4-2 against Pacific Division foes last season and are on an 24-7-4 run in their last 35 games versus the Pacific…Blake Wheeler (5G, 17A) leads the Jets in scoring against the Pacific Division this season with 22 points in 23 games. The Jets have lost consecutive games in April, but are 19-1-3 in their past 23 regular season games in April, dating back to Apr. 10/14…Blake Wheeler leads current Jets in career scoring in April with 51 points (22G, 29A) in 57 games. Blake Wheeler earned his 70th assist of the season on Tuesday, which is a franchise record for most assists in a season…He has an assist in 48 of his 81 games this season…With 90 points (20G, 70A), Wheeler is guaranteed to have better than a point per game this season for the second consecutive season…Wheeler has scored 20 goals or more in six consecutive seasons…During the past four seasons, Wheeler’s 238 assists are second most in the NHL. Defenceman Jacob Trouba had an assist on Thursday to increase his career high point total to 49 points (7G, 42A)…He needs one point to become the eighth defenceman in franchise history to record 50 points in a season…Since Mar. 18, Trouba is second on the Jets in scoring with 10 points (1G, 9A) in 10 games…He is second on the Jets with 15 power play assists this season…Trouba had 23 points (4G, 19A) in 48 games before the all-star break and has 26 points (3G, 23A) in 33 games since the all-star break. Mark Scheifele scored his team-leading 37th goal of the season on Thursday, which is the eighth-most in a season in franchise history…He can become the seventh player in franchise history to score 40 goals in a season with a hat trick tomorrow. The Jets have seven players poised to play in all 82 games this season – Kyle Connor, Patrik Laine, Bryan Little, Mathieu Perreault, Mark Scheifele, Jacob Trouba and Blake Wheeler…Laine and Little also played 82 games last season, while Wheeler will reach 82 games for the third time in the past four seasons…This is the first time in their career that Perreault and Trouba have played 82 games in a season. Winnipeg has won five of their past six games against Arizona. Winnipeg is 2-4 in their past six games in Arizona. 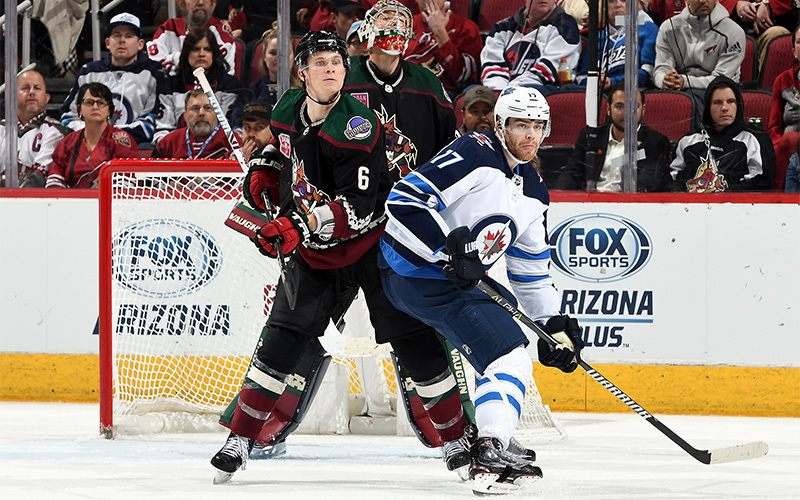 The Jets are 4-for-51 (7.8%) on the power play in their past 15 games against the Coyotes. Winnipeg is 18-for-19 (94.7%) on the penalty kill in their past five games against Arizona. Dustin Byfuglien leads the Jets in scoring against Arizona with 22 points (10G, 12A) in 34 career games. Patrik Laine (2G, 3A) and Kyle Connor (1G, 4A) each have five points in six games against Arizona. Winnipeg’s Blake Wheeler was originally selected by the Phoenix Coyotes fifth overall in the 2004 NHL Entry Draft. Coyotes goaltender Calvin Pickard is from Winnipeg. The Jets’ Jacob Trouba, Andrew Copp and Connor Hellebuyck played with Coyotes forwards Clayton Keller and Christian Dvorak at the 2017 World Championship for USA. Jets captain Blake Wheeler and Coyotes defenceman Alex Goligoski were teammates at the University of Minnesota from 2005-2007. Coyotes forward Michael Grabner played for the Manitoba Moose from 2007-10, while Arizona defenceman Kevin Connauton played for Moose during the 2010-11 season. Jets defenceman Dustin Byfuglien and Coyotes defenceman Niklas Hjalmarsson were teammates in the Chicago Blackhawks organization from 2007-2010, winning the Stanley Cup together in 2010. Jets defenceman Jacob Trouba and Coyotes forward Alex Galchenyuk were teammates for USA at the 2013 World Junior Championship and 2013 World Championship. Galchenyuk and Jets defenceman Joe Morrow were teammates last season when they played for the Montreal Canadiens. Needs two points to reach 200 points for his career. Needs three points to reach 200 points as a member of the Jets. Needs five points to reach 700 for his NHL career.